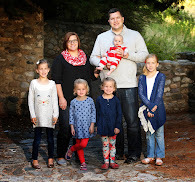 Neighbor Julia: Smoothie Freezer Pack and Some Favorite Smoothie recipes! Smoothie Freezer Pack and Some Favorite Smoothie recipes! While not an awesome picture these smoothie packs are pretty awesome! We did these for the last freezer meal night at my daughter Emeline's request. The part I liked best was the frozen yogurt cubes! Then it all gets portioned out and put in a freezer instead of keeping a giant carton in the fridge. 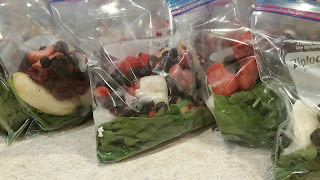 For the packs in the picture we did spinach, banana, berries and greek yogurt but they are super adaptable and you can make them just like you want. Just add them to a blender with a cup of liquid and you're set to go! Give them a try and save yourself some time on busy mornings! Spoon yogurt into ice cube tray and place in freezer. Freeze for at least six hours or until solid. When yogurt is frozen remove from trays and place two cubes in each of the 7 freezer bags. 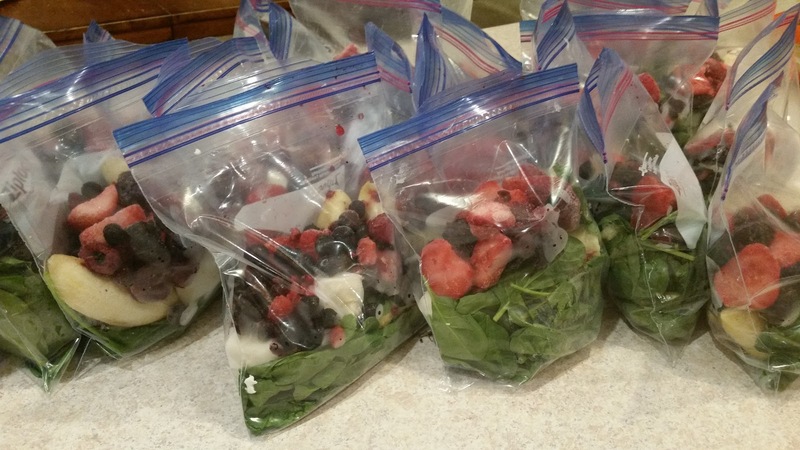 Add 1 cup spinach, 1 banana, and 1 cup of fruit to each bag. Seal well, making sure to release any extra air and freeze. When ready to serve place contents of 1 smoothie pack in a blender with 1 cup liquid (coconut/almond/cows milk, fruit juice, or even water). For a thicker smoothie add 1/2 cup of ice or another frozen yogurt pack. For a thinner smoothie add extra liquid. Add some protein powder to pack in some extra energy! Omit the spinach and use peaches in place of the berries in the smoothie packs. Add coconut milk and ice when you blend it. Use all strawberries in place of the mixed berries in the smoothie packs. Add 1 scoop chocolate protein powder with the liquid when you blend it. Add 2 T. all natural peanut butter to your smoothie pack. Add 1/4 cup extra liquid and/or ice when you blend it. Use almond milk for extra nuttiness! Use coconut greek yogurt in place of the vanilla yogurt. Use pineapple in place of the mixed berries (or do half pineapple and half strawberries). When ready to serve use coconut milk for the liquid. Omit the spinach. Use 1/2 raspberries and 1/2 peaches in place of the mixed berries in the smoothie packs. When blending use 1/2 cup almond milk and 1/2 cup orange juice for the liquid and add 1/2 cup ice. Oh wow! this isn't just perfect this is brilliant!! I think i should try this for my lunch on weekdays. Even pack it for my hubby and kids. Excellent share!